Montepulciano - This medieval town sits high up on a hill in the province of Siena in southern Tuscany. It has been in every guide book about Tuscany I have ever read and on every list of can't miss hill towns I have looked at. It is that beautiful Italian hill town that we all dream about. I had always wanted to visit but never made it because of one reason or another. Not enough time, dates didn't line up, a one day train strike, a bus that wasn't running that day just because(my favorite...such an Italian thing to happen). Whatever the reason, fate just wasn't ready for me to see it until this last march when I finally made it with my family :) It did not disappoint. Such a perfectly picturesque little hill town. All the classically beautiful nooks and crannies, all the colors, all the wine and all the food, and all the views you could ever want. We walked around on a very cold and windy day and even though we were half frozen, this place was spectacular and we took it all in for as long as we could. 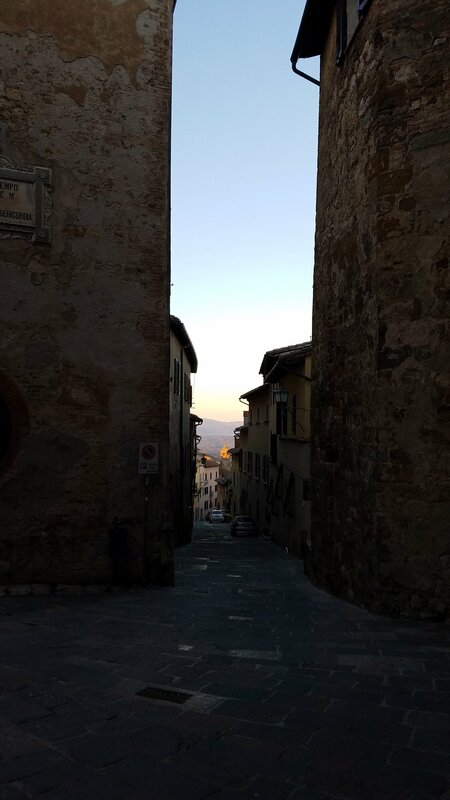 We roamed around discovering piazzas, backstreets, doorways and those incredible views. We went wine tasting and drank the classic Vino Nobile di Montepulciano from the area. As the day turned to evening and the sun started to set, the whole town glowed in vibrant yellows, oranges and golds. It was truly breathtaking and if you are ever here and have the chance to stay until sunset and you want to see one of the most beautiful things ever.... I would definitely recommend it! After a little rest at our B&B we made are way to dinner at Pane Vino e Zucchero(Bread Wine and Sugar). A little tucked away trattoria with just one table left....thank goodness! They had delicious food and beautifully plated dishes. The ambiance and the staff were warm and welcoming and we enjoyed chatting(especially my son) with the friendly local Italians. It was the perfect ending to a lovely day. We stayed just one afternoon and one night here in Montepulciano on our way to Florence at a B&B called Bed & Breakfast Vicolo del'Oste. It was right in the historic center but on a thin side street which made it feel a bit more secluded. The owners were friendly, helpful and knowledgeable about the different options around town for wine tasting and dining. When we checked in they gave us vouchers for breakfast the next morning at a cafe close by. Having had anything from boxed croissants in plastic and vending machine coffee to a beautiful spread of meats, cheeses, fruits, local pastries and gorgeous cappuccinos, I wasn't quite sure what was in store for us. I couldn't believe my eyes when we walked up to Caffe Poliziano. How was I lucky enough to have come across this place by way of a breakfast voucher? And how had I never heard of this place before? Classy, unique, and beautifully decorated, this place made me feel like I was stepping back in time. It was just what I needed. I was so excited! When we arrived it was quiet with only a few people standing at the bar. We were drawn to the gorgeous window in the back but didn't realize just what beauty we were in for until we walked through and stepped up into the seating area. Lined with tables and mirrors on each side of the room, you are drawn closer and closer to the window....when you arrive, and you look out, you see it. That view! That heaven! That ridiculously amazing Italy! We had the whole place to ourselves and we all just stood there for a few minutes taking in this little paradise. At this point I wouldn't even have cared if the croissants came in plastic and the coffee was cold, I was in a happy daydream. Fortunately they didn't, and we had lovely cappuccinos, fresh squeezed orange juice, cornetti(croissants) and tramezzini(little crust-less sandwiches). Everything was delicious! Everything was perfect. Everything was just what we wanted it to be(minus the fits from out kids :) We ate. We sipped. We took photos. We played with the kids. 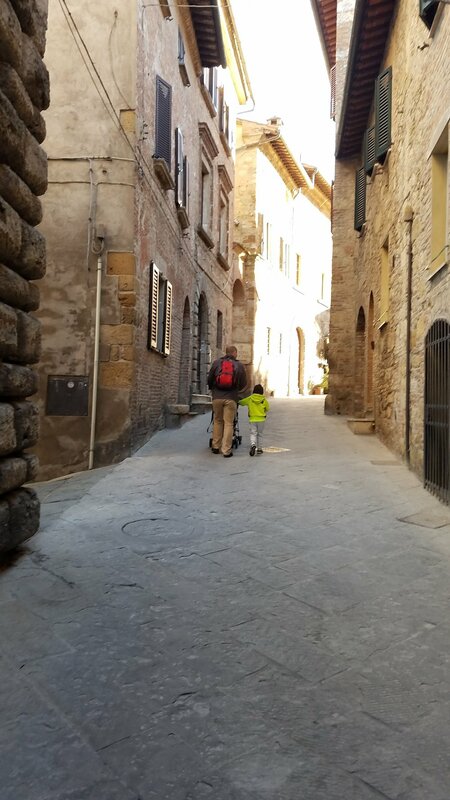 We stayed for as long as we could before heading off to our other Tuscan adventures. We will definitely be back.....maybe next time for a cocktail on the balcony. Caffe Poliziano is perfect for your morning cappuccino and cornetto but they also have lunch, dinner, cocktails, wine, music, art and events if something else suits your fancy. There is another dining area with large tables, art, a view, and a grand piano. On their website I also saw a terrace that looked incredible. This place is definitely worth the stop! 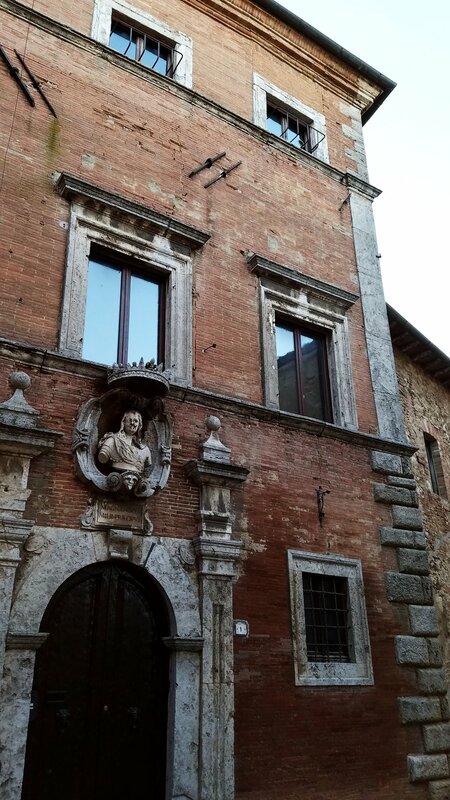 It is located at Vicolo di Voltaia, 27, 53045 Montepulciano SI, Italy. The hours are open 7 AM - 12 AM 7 days a week. Website - caffepoliziano.it. Number - 39 0578 758615. 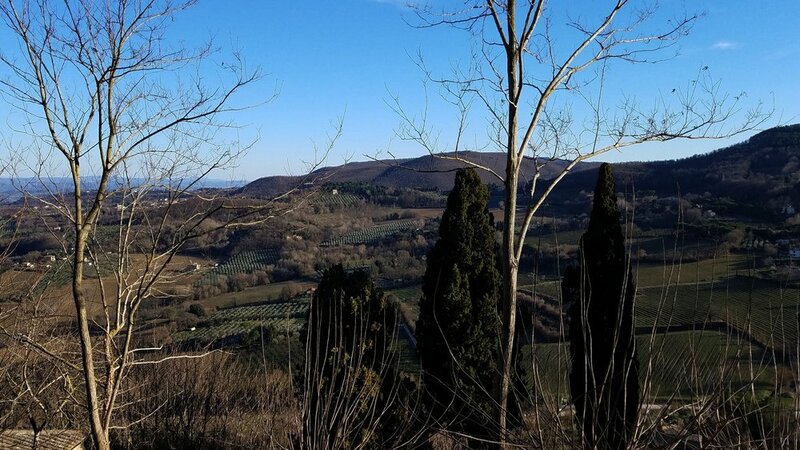 Montepulciano is approximately a 2 hour drive north from Rome, a 1 1/2 hour drive south from Florence and a 45 min drive southeast from Siena. It is definitely worth a day trip, especially if you are into incredible views, exploring and getting lost on back streets, and drinking really good wine! 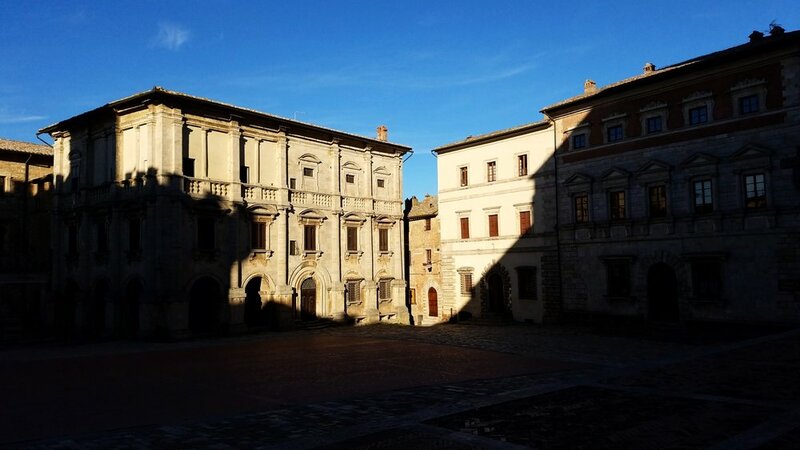 This place is famous for it's Vino Nobile di Montepulciano red wine and there are many tasting rooms for you to get your fill. 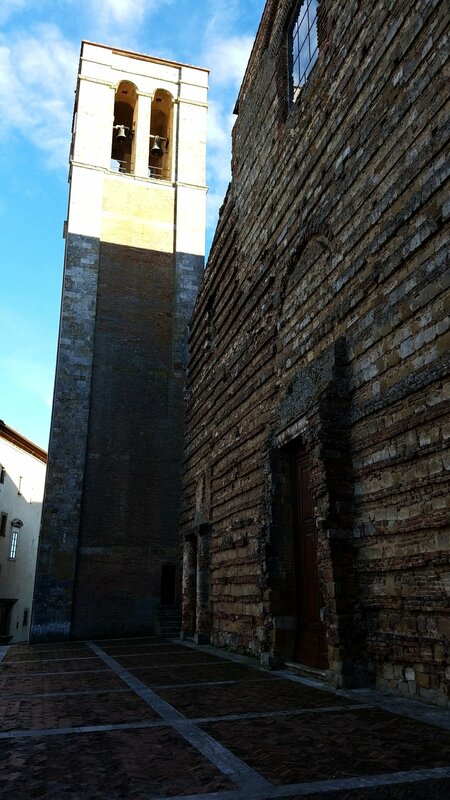 The main piazza in the town, Piazza Grande, is very beautiful and interesting. The Duomo with it's unfinished facade adds to the medieval feeling of the town and the Palazzo Comunale, which looks like the little brother to the Palazzo Vecchio in Florence, really makes you feel like you are in the heart of Tuscany. A presto! And remember this place definitely goes good with wine!